The last 12 months have been some of the most unsettling times for investors. 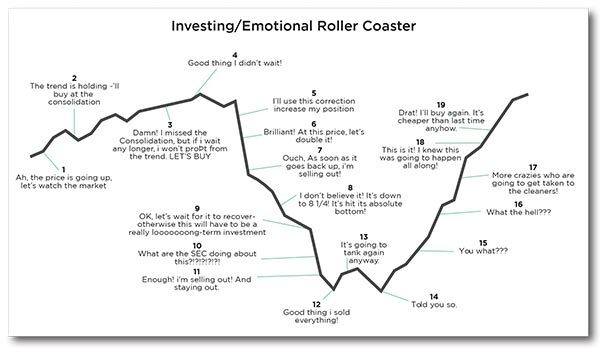 Investor sentiment is never a surprise. When the markets go down every day, like in 2008 & 2009, investors have the option of selling, raising cash and watching from the sidelines. But what do you do when the markets are up 3 days in a row and then down 3 days in a row, week after week, month after month? Easy, stay disciplined, know the facts behind investing and stick to a plan !! We understand that the cable channels can scare the heck out of you. Heck, they scare us at times. We realize that you worked hard for your money. We realize that these are important assets. We take the time to generate our monthly research to alleviate fears and bring a sense of clarity to an otherwise blurry and sometimes even scary picture. At WT Wealth Management we have absolute conviction in how we approach building and managing your portfolio. Unlike some managers that do things because they have always done things that way, we believe in emulating proven techniques coupled with an innovative approach to portfolio management. Should I be In or Out? Investors, acting on their own, have an uncanny ability to buy high and sell low. Even if they tried to do it they couldn’t do it much better. Investors acting on their own reach the fear factor faster without a professional advisor. They exit the markets, only to re-visit the greed, I missed it, factor when being left behind when the markets move higher. It’s never a great strategy to buy back in as the market peaks, or to sell low. We’ve seen it first hand for years. The following chart is “tongue and cheek”, but sadly true. It’s like Charlie Brown and the football, he really wants to boot it but deep down knows he’ll be flat on his back at the end of the day. But still he tries. History has proven that staying with a plan and not trying to avoid the ups and down is a proven way to advance wealth in the equity markets. Assets invested in the equity markets should be long-term assets. Assets at risk shouldn’t be funds you need to access next week for a new fridge, or next month for a vacation. In our opinion, every investor before they allocate a single dollar to a stock or bond should have at least 6 months liquid living expenses in the bank, maybe more for the more conservative. All revolving debt should be eliminated or well under control and everyone should have a monthly budget to which they adhere. It doesn’t make sense to be paying 19.8% on a credit card and investing money and getting say, 8%. 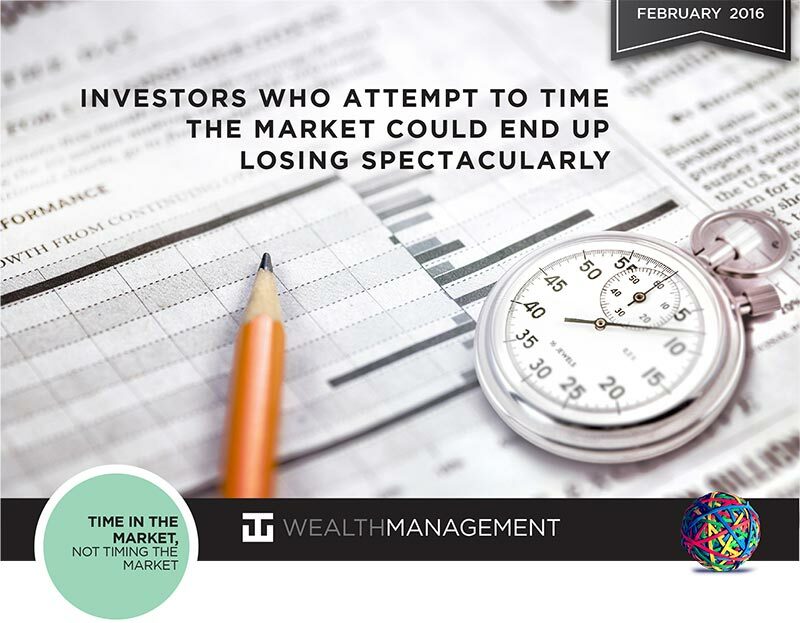 With the behind us, let us look at the effects of timing the markets, or worse yet having bad timing. What if we miss the best 25 trading days since 1970? Charts like the one below show the damage an investor would have done if they missed out on only the 25 best days (out of 11,620 trading days) since 1970. If you somehow managed to do this, your returns would have gone from 1,910% to 371%, or 6.7% a year to 3.4% a year. To give you an idea of how lousy 3.4% is, a 1-month U.S. T-bill, bought over and over again, returned 4.9% over the same period of time. Think about this, those dramatic results are only achieved by missing .0021514% (25/11620) of the trading days. A cynical investor might ask: “If you’re going to leave out the 25 best days, why not leave out the 25 worst days?” OK, fair enough, missing the 25 worst days is equally as unrealistic as missing the 25 best but we can look at it. In the chart below, you’ll see that the investing “wizard” who dodged these 25 bad days would have gained 12,045%, or 11% a year, compared to the 6.7% for the investor that was all in, all the time. However, in 25 years I’ve never seen anyone miss all 25 worst days. Ok, so what if an investor avoided the 25 best and 25 worst days?” This returned 2,750% versus the 1,910% earned from the buy-and-holder. So, avoiding the outliers and just having exposure to the “regular” market days was a decent way to invest it appears. Can one miss the 25 best and worst days? We are not suggesting it’s easy or even possible to achieve missing the best and worst days, but there is something interesting about the best and worst days. In the chart below, we can observe that these days tend to cluster. (The green dots represent the 25 best days and the red dots represent the 25 worst days.) Furthermore, they cluster during volatile markets. 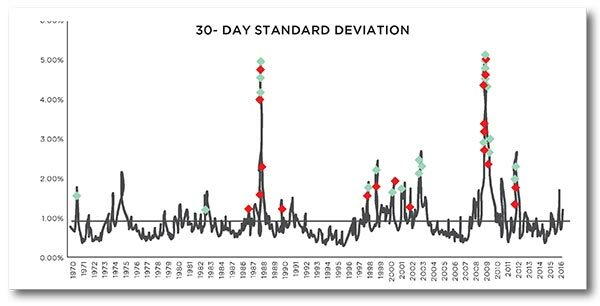 All 50 of these days occurred when volatility was above average (the black line). Some of the best managers will do less and have more cash when volatility picks up. Sure, they’ll miss a lot of the best days (again see above chart), but if they can miss the best and worst days, then maybe that’s an endeavor worth pursuing. The most important thing, whether you’re attempting to time volatility or to simply sit through it, is to understand the risks inherent in whatever you’re doing. The one thing I can assure you is that selling into weakness has never made anyone money. Sure, everyone may hit his or her own capitulation point and say “I’ve had enough” but if you work with a financial professional they can “hand hold” you through it and postpone the selling and assist you in selling into strength if that’s really your goal. At WT Wealth Management we believe in being fully invested for our clients. You do not pay us to manage large cash positions. You can do that on your own. However, we will raise more cash during volatile times and seek out less volatile asset classes. We believe money is hard to come by, even harder to accumulate and we are always aware of our downside exposure and risks. One of the many pearls of wisdom dispensed by Warren Buffett is “Rule No. 1: Never lose money. Rule No. 2: Don’t forget rule No. 1”. Unfortunately this is easier said than done in the real world. Investment managers are acutely aware of investor aversion to losses. Losses on portfolios can be due to market movements in the price of the investments or when investments go under or default on their obligations. The latter is permanent capital loss, as there is no opportunity to recover from that loss. 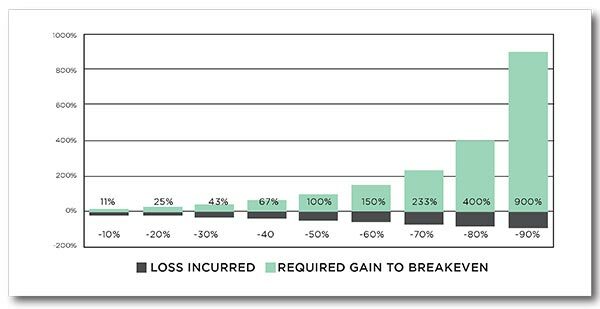 When suffering losses, an investor requires a return higher than the loss to return to breakeven. The graph below shows the subsequent required return needed to breakeven for a particular levels of loss. This is simple math, nothing fancy or sneaky. Lose 10% and you need an 11% gain, not impossible and very likely to happen in a reasonable amount of time. Lose 30% and now we are talking much longer recover periods. Lose 50% and it could be a generation before you are back even. Investment managers have different ways in attempting to minimize possible capital losses. If the investment manager is managing a multi asset class portfolio he/she will be able to underweight or avoid asset classes that are expensive (high in risk) and instead, attempt to allocate capital to asset classes that are cheap (low in risk). No manager is exactly alike and each has a different way in classifying risk and varying levels of risk aversion. At WT Wealth Management we strive to deliver risk and reward not to our taste or liking but to those of our clients. We realize every client is different. Of the hundreds of accounts we have no two are alike. We believe it’s like DNA. Managing volatility in our client’s accounts is what makes us different. We want to know how much movement will keep you awake at night and stay just short of that. It’s a balancing act, more art than science as we want to move your account forward enough that we justify our existence, but we also want to respect your risk number. The aggressive manager will tend to ride the run as far as possible and will experience a bigger drawdown when the markets correct. Managers that avoid deep drawdowns typically perform better over full market cycles. This is one of the reasons one should take time to understand a manager’s philosophy and investment process. You might just be able to spare yourself some heartache by avoiding making an investment with an aggressive manager at the peak of a market cycle. At WT Wealth Management we understand that risk needs to be taken to generate inflation beating returns, but we make every attempt to structure our solutions in order to ensure that our clients do not experience permanent capital destruction.